2011 has been a year of uncertainty and turmoil in the global markets. In the latter part of the year we saw wild gyrations in the U. S. stock markets with the Dow Jones Industrial Average (DJIA) having a record number of days with 400 points or more moves. The European and Asian markets were no better. So what was the final scorecard? The Dow Jones Industrials (or Dow as we’ll call it) did the best with an annual return of 8.4%, just 2-3% below its historical average of about 11%, since 1940. At its peak for the year the Dow was up 11% (in May) and at its bottom it was down about 7% (in October) for a net see-saw of 18%. The S & P 500 Index, on the other hand, only gained 2.3% for the year including dividends. And it gyrated a bit more: from a peak of 8.5% to a bottom of -11%. Its volatility as measured by the annual standard deviation was similar to that of the Dow. The NASDAQ did worse than both the Dow and S&P500. The annual return was negative and the volatility was similar to the Dow and S&P500. This last bit was a surprise as the NASDAQ is usually quite a bit more volatile. The worst performer, by far, was the Russell 2000, an index of 2000 small companies. It lost 4.5% while the volatility was sky high. At its worst it was down 23%! Thus the winner in the U. S. was (tada!) the Dow. How about if we looked at Europe and Asia? Were they better or worse than the U. S.? They all did very poorly indeed, with the U. K. being the best at a return of -7.7%! In addition the risks in these markets were very high as you can see from the standard deviations and the variations from the highs to the lows. The standard deviation for India is artificially low because it is calculated in rupee terms and does not include the additional volatility of the rupee. The rupee fell almost 20% in 2011, while the other currencies were not so volatile. India was a complete disaster and the prospects for 2012 are also quite cloudy. So the good old United States was the place to be in 2011. The Global winner in 2011: The Dow. You could have beaten the Dow, of course by being in gold, or oil (big integrated oil companies only), or big cap, high dividend stocks (like large utilities), or consumables (like tobacco). Would you have known? Maybe. Best to stay in the Dow for most passive investors. Most professionally managed mutual funds, after fees, as usual, did not beat the Dow. Hedge funds are said to have done very poorly in 2011 also. If you were weighted financials, high tech, health care, airlines, drug companies, even coal or alternate energies you would have been creamed. In general when the economy is doing poorly, as it is now, and pessimism is rampant and prospects for housing, employment, credit etc are low, the large cap stocks will have an advantage. They can borrow cheaper because they can float their own paper, and they are less likely than their competitors to perish from market forces and inability to set prices. ”Them as has, gits“ goes a popular market idiom (along with “aint no free lunch”). The Dow represents about 40% of the total market cap of the NYSE so even though we are talking about only 30 stocks they are substantial. For the next year the Dow stocks are predicted to yield 3.01% according to IndexArb, that tracks such matters. That’s icing on the cake in times when the 10-year government bond is yielding less than 2%. 2 Responses to And The Winner Is …..
How does DJIA compares with the DJ utility Average Index. Do you have any data for this year and over the long haul and could you factor in this comparision the high dividend paid by utility stocks. My data on DJU, the Dow Jones Utility Index, is that it was up about 15% last year, beating the DJIA handily. Over 5 years the Utility index return has equalled the Dow return. Over 10 years it has beaten the Dow. 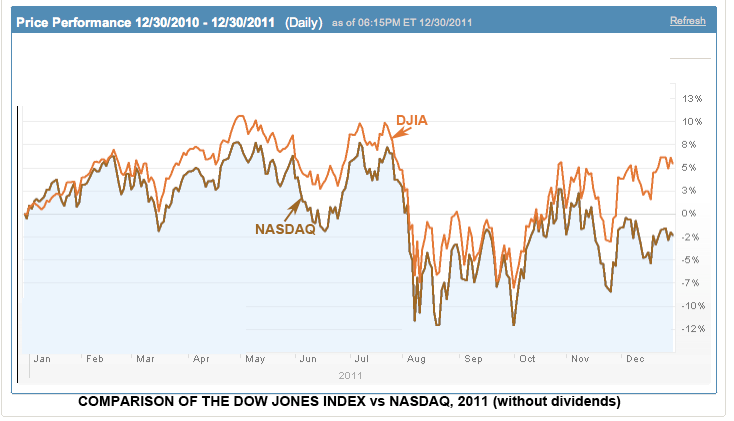 Over longer periods the DJIA beats it by a fair margin. I have to check whether they factor in the dividends in the DJU. They don’t in the DJIA.